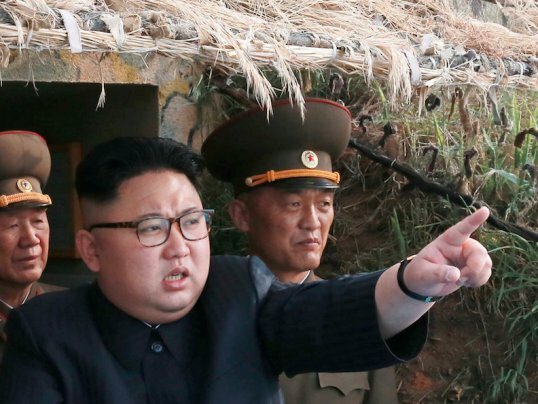 As Americans slept through the first few hours of July 4, Kim Jong Un personally observed the culmination of a years-long goal – the testing of a missile that he can use to nuke the US mainland. Flying nearly 1,800 miles high above earth, the missile flew for over 35 minutes before crashing down into the sea, according to David Wright of the Union of Concerned Scientists. North Korean media stated that it shot the missile at a high arc so as not to hit any other countries. Wright calculated that at a normal trajectory, the missile could fly 4,160 miles, or as far as Alaska from North Korea. Kim Jong Un has long threatened the US with nuclear attacks, and done everything in his power to demonstrate the capability to launch such an attack. While a single successful ICBM test doesn’t mean North Korea has full combat capability, it could indicate that it’s just a few months away. Meanwhile, the US has taken every step short of military strikes to stop North Korea, saying that the era of “strategic patience” had ended and that “all options,” including military strikes, were on the table for reeling back the rogue state. In the aftermath of the test, Trump tweeted that China may try a “heavy move” against the Kim regime while hinting that South Korea and Japan could retaliate. But North Korea’s independence day missile launch wasn’t a message to China, South Korea, Japan, or anyone besides the US. Kim Jong Un has told the US it’s at risk of nuclear attack.